Wellington, FL – February 25, 2013 – The Challenge of the Americas unfailingly draws top riders from around the world, and this year’s duo from Canada is no exception. The accomplished mother-daughter pair of Evi Strasser, an Olympian dressage rider and a longtime Canadian National Team member, and Tanya Strasser-Shostak, an up-and-coming Young Rider, will perform a pas de deux at the March 9 event. “It’s such a good cause and it’s something that’s affected everybody, or someone that we’ve known,” Strasser-Shostak added. The pair is choreographing a test that will showcase the best qualities of the two horses they choose for the event. Strasser plans to ride her Grand Prix horse, Action Tyme, while 17-year-old Strasser-Shostak has yet to decide between Dancing Tyme and the Karen Soupcoff-owned Ruby Tyme. Strasser-Shostak, who will take on the challenging task of fitting music to the test, is enjoying her involvement in all aspects of the planning and preparation. With their extensive competitive experience, the mother-daughter duo fit right in among the renowned international riders who gather at Challenge of the Americas to support breast cancer research and put on a show for spectators. Evi Strasser has been among Canada’s top dressage competitors for the past two decades. Born in Germany, she moved to Canada in 1988 and founded Good Tyme Stables in 1994. She represented Canada at the 1996 Olympic Games in Atlanta, riding Lavinia. In 2003, Strasser helped secure a team Silver Medal for Canada at the Pan American Games in Santo Domingo, where she also finished eighth individually with Quantum Tyme. She and Quantum Tyme earned the highest result for a Canadian pair at the 2006 World Equestrian Games and also competed at the 2005 and 2007 World Cup Finals. Strasser has often been selected as the alternate for Canada’s teams at such major events as the Olympics and World Equestrian Games. She continues to compete at the highest levels of the sport and collected many top results on the international circuit in 2011 and 2012. Strasser’s influence on the dressage world extends beyond her own impressive competitive results. She specializes in training young horses up to the Grand Prix level, and several of the horses she’s worked with have gone on to make their marks on the international dressage scene. Hiscox Artemis was the most recent of a number of graduates of Strasser’s program to compete at the Olympic Games. Strasser trained Hiscox Artemis through to the World Cup before selling him, and, with rider Richard Davison, he was chosen as the British team’s individual entry for the 2012 Olympics in London. He also finished fourth in the 2012 World Cup Final. Strasser-Shostak has already compiled an impressive record and appears poised for another successful show season in 2013. 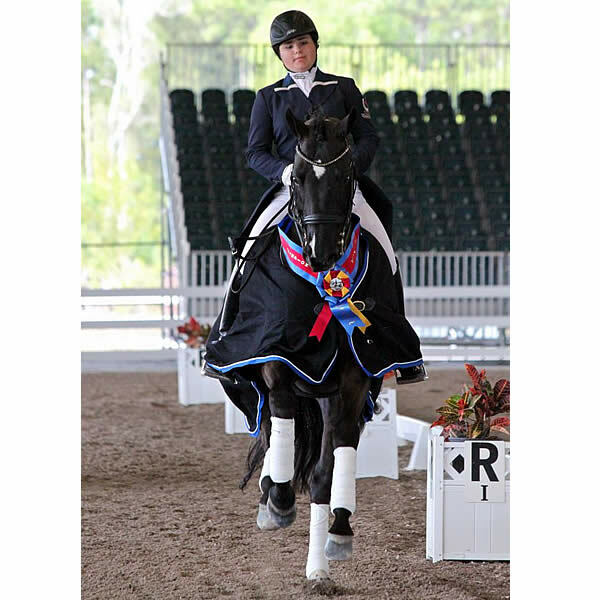 She was the youngest competitor in the Young Rider division at the 2012 FEI North American Young Rider Dressage Championships (NAYRC), where she collected a team Bronze Medal and finished eighth individually on Dancing Tyme. She also rode Dancing Tyme to several top-three finishes in the Young Rider divisions. With Ruby Tyme, she earned top placings in the Junior divisions, including several wins at CDI competitions in West Palm Beach. Strasser and Strasser-Shostak are in South Florida for the winter competitive season, training and campaigning several of their horses. Strasser-Shostak hopes to return to NAYRC and will try to qualify for the Young Rider World Cup in Europe, while Strasser is taking her time preparing new Grand Prix mount Action Tyme for the international scene. “Most of the time, you see older people do it and it’s good, I think, that there’s someone a bit younger also in it,” she continued, noting that breast cancer research is an important cause for her generation to support as well. For more information about the Strassers, visit their website at www.goodtymestables.com. To learn more about The Challenge of The Americas, go to challengeoftheamericas.com. To buy tickets, contact Mary Ross at (561) 433-0988 or Anglot@aol.com. Find us on Facebook at https://www.facebook.com/ChallengeOfTheAmericas. The Challenge of The Americas (COTA) presented by SSG Gloves, known throughout the equestrian world for its spectacular performances on horseback, returns for its 11th anniversary to continue its fight against breast cancer. This annual fundraiser is a one-of-a-kind affair that highlights the equestrian sport of dressage. Competing riders include the “Who’s Who” of top equestrian competitors in the United States, Canada, Latin America and Europe. There are few, if any, places throughout the world where an audience can delight in the performances of such a large and distinguished group of riders and their magnificent equine partners. The Challenge of The Americas’ teams of international riders compete in quadrilles to world-class music and choreography in an effort to raise money to help find a cure for breast cancer. Proceeds benefit the Breast Cancer Research Foundation through Play for P.I.N.K. Cunningham & Cunningham Livestock, Inc. Play for P.I.N.K. (Prevention, Immediate diagnosis, New technology, Knowledge) is a grassroots organization dedicated to raising funds to fight breast cancer, by creating and promoting awareness of breast cancer through sporting and lifestyle events including men’s and women’s golf tournaments, tennis, swimming, card games, equestrian events, and shopping benefits. Our commitment is to contribute 100% of all funds raised to our beneficiary, The Breast Cancer Research Foundation. In 2012, PFP donated $4 million to BCRF for a cumulative total of $29.75 million. For more information about PFP, visit playforpink.org.